Like most W. German pottery companies, Scheurich named many of their glazes, but they also named some of the shapes, including Jura (snail), Amsterdam, Wien (Vienna), and Koralle (coral). 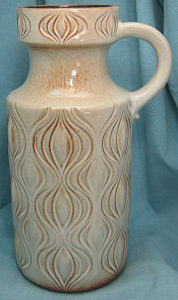 As with many Scheurich forms, these can be found with or without a handle. Jura has a square body with rounded corners and a round top. The body is impressed with a spiral design with the look of a fossil. 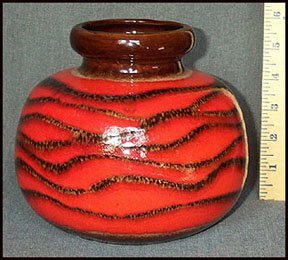 It can be found a fairly wide range of glazes, with a red/black foamy glaze among the most common and most sought after even though this particular glaze often partially obscures the design. The Amsterdam form features a side view of a tulip bulb embossed into the round body. The image is similar to the side view of an onion, and before the official name was known, the collector name became “onion.” Unfortunately, such names have a tendency to continue in use even when more accurate information becomes available, and that has been true in this case. 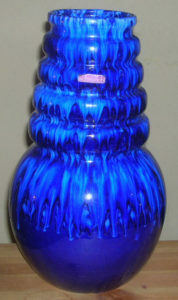 Glazes are often two-toned, as in the example pictured with thick glazes not well suited to the design. Note that Scheurich has re-released the form, but it can be distinguished by the lack of the “Amsterdam” design around the top. Amsterdam is an effective design and very common on the market. As usual, there are finer examples that are harder to find that can command a premium price. Koralle features a deeply embossed “bubble” and line design that suggests an underwater scene in keeping with the “Coral” name. It’s slightly more difficult to find compared to some of the other “Named” forms but also perhaps a bit less successful in terms of aesthetics. The body is round and often a bit chunky in proportions. While “chunky” can be done successfully, that’s not really the case with Koralle, although that may be less true on some variations. 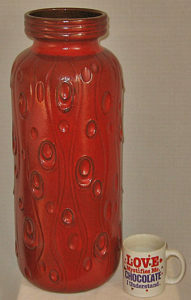 As with similar embossed designs, the glaze is commonly two-toned or two colors, as with this red example that has a brown glaze showing through slightly on some high parts of the design. Ceramos and Wein take a somewhat different approach with the name based on the general shape rather than any embossed design. Ceramos is a very simple “pumpkin” form, as if a ball were slightly squashed. It works in part through proportions and through some very successful glazes that display particularly well on this form. Ceramos is found both with and without a handle. The largest size I’ve seen is 12″ (30cm) and a little more vertical…a “pulled” pumpkin. Ceramos is a very common shape, so most of the market value is in the quality and scarcity of the glaze. The Scheurich Wien (Vienna) shape features a bulbous body with a stack of rings for the neck. It’s an Art Deco echo and can be quite effective, sometimes not so much. I think that adding a handle is particularly ineffective on this form, especially since it takes the place of some of the rings, throwing off the proportions. The varied surface creates interesting effects with some glazes. 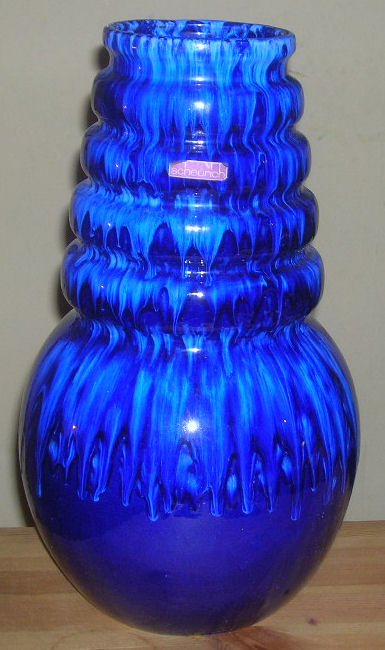 The Wien form also features the tallest item in Scheurich’s line with a 65cm version, which is about 26″. As with most of the shape-named lines, the form is common, which keeps prices low. 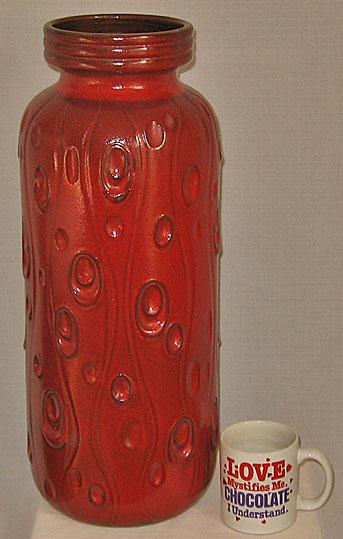 Naturally, the more uncommon glazes and those that work well with the shape should bring a premium.